When I first came across this coat on Pinterest, it was one of those moments where you click the picture and keep your fingers crossed that A) the link to the item will work, B) it will just happen to be your size, and C) it won't be sold out. I was surprised (and delighted) to find that this coat isn't vintage at all and I could get it in any size I wanted. The buttons up the back and the bows on the sleeves are the sweetest touches. Happy Thursday, friends! I'm off to do some party planning for Poesy's birthday tomorrow. I can't believe she's going to be 3 already! That is such an adorable coat! Love the colour against your hair....very fun & vibrant. That coat really is gorgeous! The color and details are just fantastic! It's the perfect color on you too!!!! That coat is so cute! I love that feeling when pinterest leads you to the right place automatically! There's nothing more disappointing that following a link for what feels like AGES and coming up short still. Also, those glasses are awesome. My sister just bought them a couple months ago and I'm still in awe of those awesome sparkles. Can we follow you on Pinterest? I love that coat! It's so pretty!!! That coat is adorable, and now it is sold out! Darn it. Anyway, I've been needing new glasses for a while I stepped on mine in the middle of the night two months ago and have been living with broken glasses ever since... I love the ones you are wearing in these photos! I think I will order them when I get home and can look up my prescription! Hi. I'm a french fan and followed you months ago. I love your new coat. 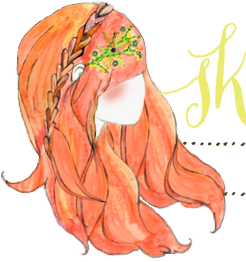 it fits well with your hair color. 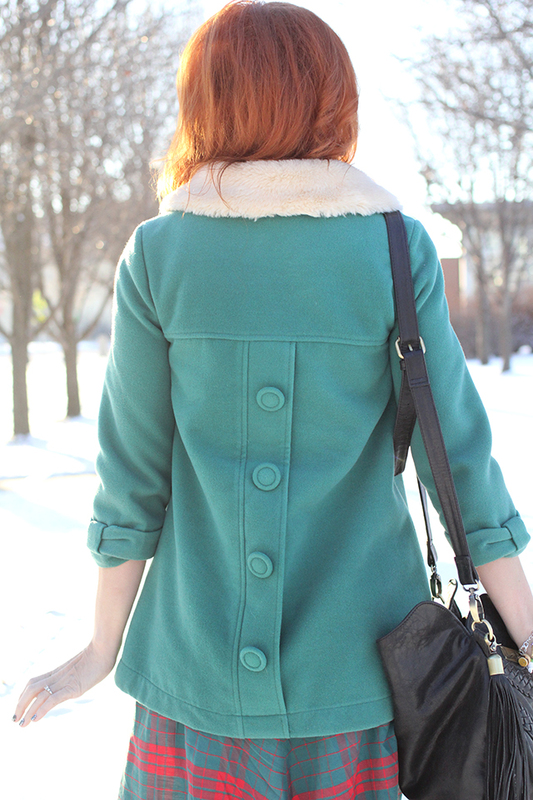 The greenish teal coat and your orange hair look lovely together! I am so jealous of all of you guys' snow!! 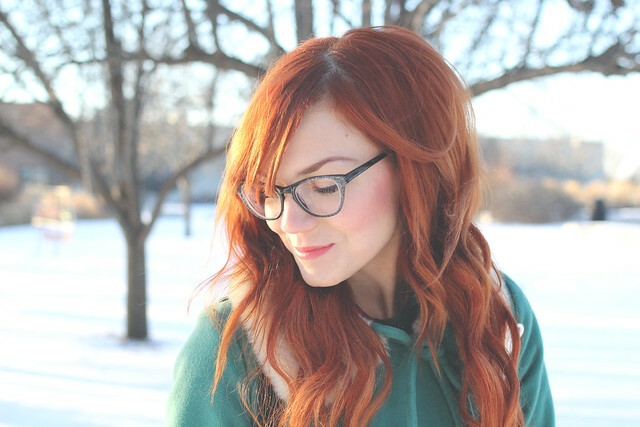 Really really loving those glasses. And I love your entire outfit. 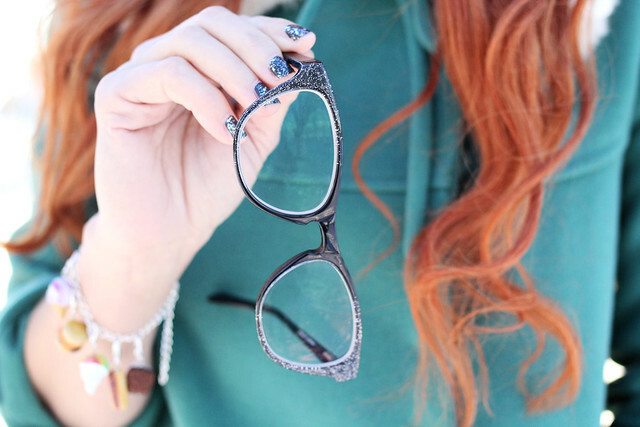 Oh my gosh your hair / glasses / makeup looks just PERFECT. Seriously. LOVE that coat! Now it is sold out though haha! 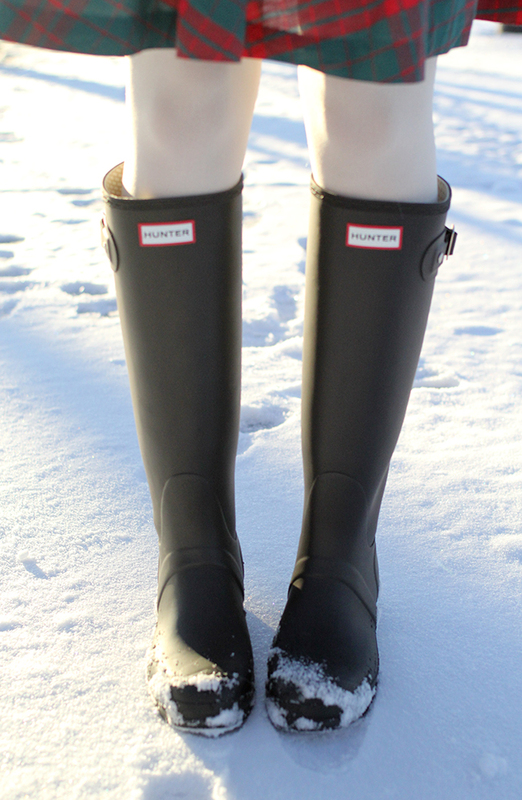 The perfect outfit to be photographed in the snow! Both the coat and your glasses are delightful! that coat is so so lovely, especially with your hair! it really does look vintage. I bought the selfies too, right after they came out, but I have to wait for them to return to me -- there was an issue with my Rx. Can't wait to get them back! That coat is so beautiful and I love that dress too - you look so elegant!